Xiaomi has succeeded in taking the good ingredients of Redmi Note 3 and churning out a winner like Mi Max, which we believe will rule the niche 6.0-inch plus phablet segment as there is hardly any competitor. 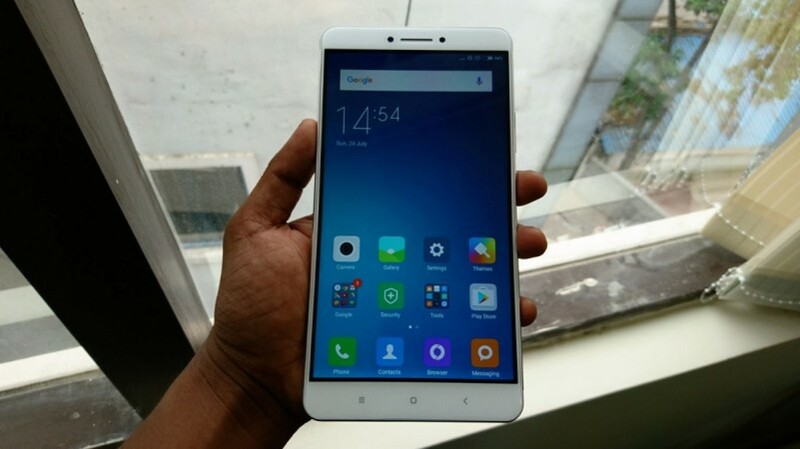 Following the success of the Redmi Note 3, Xiaomi released the massive 6.44-inch Mi Max this month. We spent more than two weeks with the Mi Max and during the testing, it has impressed us in most of the aspects. Here's our take on the Xiaomi's Goliath-inspired phone. In 2011, Samsung launched the first generation 5.3-inch Galaxy Note leading to the creation of the new category in smartphones -- Phablet, an hybrid of phone and a tablet. Since then, 5.5-5.7-inch size range has become the standard norm for phablets in the industry. Xiaomi's Mi Max pushes the boundary beyond the 6.4-inch, blurring the line between a phone and a tablet. But despite its mammoth size (173.1 mm in length), the Mi Max is quite easy to wrap around the fingers, even those having small hands. It measures just 88.3 wide and 7.5mm in thickness, that too at the middle. It's body tapers at the edge and the chamfered metal-based chassis provides excellent grip to the hands. The power button and volume rockers are placed on right side of the edge. During our tests, both the keys fared well in terms of tactile functionality; whereas on the left side of the edge the company has incorporated SIM tray with smart dual-SIM slots is clean with no buttons. On the top, Mi Max features 3.55mm audio to the extreme corner with IR sensor and mic beside it. At the bottom, two single-grille speakers are placed at each corner with micro USB port at the centre. On the back, the Mi Max features plastic-based caps on the top and bottom, but thanks to Xiaomi's craftsman ship, the colouring and design makes it blend with metal-cover on the back, actually much better than the Redmi Note 3 series. For normal day-to-day use, we found that it can easily slip into the front pocket of regular jeans pants. But it gets really uncomfortable when kept in the back pocket and also it is hard to fit it in a skinny and slim-fit based trousers. Furthermore, the generous use of metal in the phone makes the phone a little heavy to carry around. It weights 203g, almost a 1/4th of a kilogram. The Mi Max boasts a massive 6.44-inch full HD (1920x1080p) 2.5D glass screen with 540 nits brightness, pixel density of 340 ppi (pixels per inch) and is protected by Corning's Gorilla Glass 3 shield. It also boasts proprietary Sunlight display technology for clear view under bright light condition and it did fare well in that aspect during our tests. We also tried playing 4K videos on the phone and it came on top with no signs of lagging. The Mi Max is perfect phone for binge watching movies thanks to its massive battery (more on that later). Xiaomi's new phablet houses Qualcomm Snapdragon 650 (ARM Cortex A72 dual-core + ARM Cortex A53 quad-core) series hexa-core SoC (System-on-Chip) with Adreno 510 graphics engine same as seen inside Redmi Note 3. That being said, the phone is snappy while switching between multiple applications and there is hardly stuttering when playing power-intensive games such as Asphalt 8 and others. If played a bit longer, the phone gets heated, but this is not that a big deal considering most phones do get hot when played for long. The Mi Max scored an impressive 1,532 and 3,671 on Geekbench in single-core and multi-core performance tests, respectively. It also scored 16,384 points on Quadrant benchmarking app. The Mi Max runs the Android 6.0.1 Marshmallow-based MIUI 7.5.3 UI. It has a very simple interface and offers lots of short-cuts. The MIUI also comes with one-hand operation feature with three options. Depending on the size of your palms, you can choose 3.5-inch or 4.0-inch or 4.5-inch. To makes things more convenient, the company has also incorporated a handy "Quick Ball" feature. It lets users to keep five frequently used actions like going back, returning to the home page, turning off and other gestures in single using just the thumb. These actions can be customised to the user's liking and are available from the Lockscreen. Like all Xiaomi devices, it comes with 'Report Bug' where it allows users to file complaints or anomalies in MIUI to Xiaomi software team. Report Bug is one of the hallmark initiatives of Xiaomi, which make their devices so desirable. Xiaomi Mi Max is also slated to get the new MIUI 8.0 next month. Again, Mi Max comes with same camera hardware as seen inside the Redmi Note 3. It boasts a 16MP camera with PDAF (Phase Detection Autofocus) function, dual-tone LED flash, HDR, face/smile detection, dual-ISP (Image Signal Processor). During our tests, it performed well day light environment. The phone's camera took really good quality snaps during the day, but the device could not repeat the same feat in low-light conditions. On the front, it houses a 5MP. It's an average camera, but gets a few extra brownie points for its intuitive photo editing apps. You can see the Mi Max camera's picture samples below. Besides the display, battery is the other key aspect of the Mi Max. It houses a massive 4,850mAh battery, 20% more than Redmi Note 3. During our tests, the Xiaomi's Mi Max easily lasted two days with internet on, including a few sessions of talk, video playback on YouTube, surfing and WhatsApp messaging. We also tried playing three 720p HD-based movies with average play-time of 2 hours and 15 minutes on a fully charged battery. It played all three with few more hours left in its tank. The Mi Max's fingerprint sensor placed on the back of the Mi Max is one of the finest we have come across. Throughout the two-week testing period, we never faced a single false rejection issue. Xiaomi Mi Max is kind a stretched version of the company's bestselling phone Redmi Note 3. It houses pretty much same internal hardware as seen inside the latter. That being said, Xiaomi, to an extent, has succeeded in taking the good ingredients of Redmi Note 3 and churning out a winner like Mi Max, which we believe will rule the niche 6.0-inch plus phablet segment as there is hardly any competitor. The Mi Max's big full HD screen and large battery will certainly appeal to the youngsters who like to use phones as their primary entertainment device.